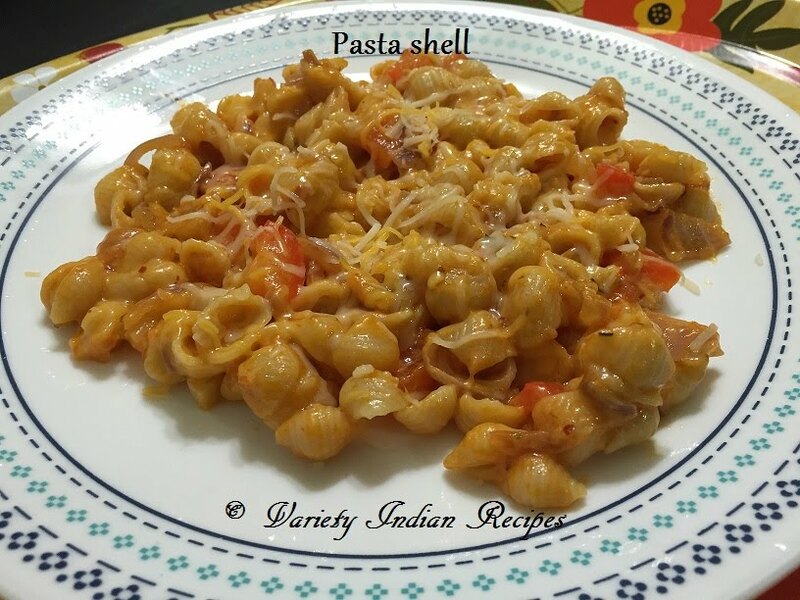 This is a easy pasta shell recipe where pasta is cooked in freshly prepared tomato sauce. Here fresh tomatoes and basil are simmered with garlic and Italian seasoning to make a delicious recipe. Boil tomatoes in water. Allow the tomatoes to boil until the skin peels off. Let the tomatoes cool down. Now peel off the skin and grind it to a smooth puree. Bring a pan of water to boil, add little salt, 1 table spoon of oil. Add the pasta to it and cook for 10 to 12 minutes until the pasta is soft. Heat oil in a pan, add one half of the chopped garlic and saute. Once the garlic is browned add the tomato puree and boil for 5 minutes. Add one half of the chopped basil leaf, red chilli flakes, oregano, salt and mix well. Allow to boil until the oil oozes. Now pasta sauce is ready. Heat some oil in a pan, add the remaining garlic and saute. Add the onions and saute. Once the onions are transparent, add capsicum and saute for 2 minutes. Now add the remaining basil leaves, cooked pasta and saute. Pour the pasta sauce over the pasta and toss until the sauce gets well coated. Sprinkle grated cheese and serve hot.